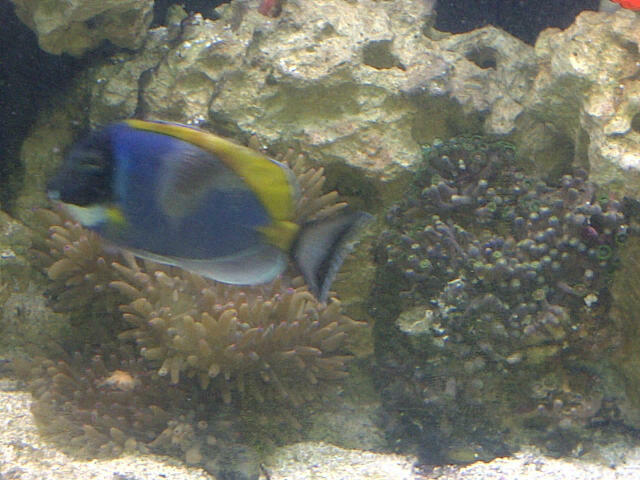 I really need your help right now I just bought a powder blue tang and he is really sick and I am not sure what he has and what I can do to help him. he is very scaly i have attached Pic i have more if you want to see more..
Why did you buy a sick fish? That doesnt look too new definatly bee there a while. I would get him into a QT tank right now and start with an anti bacterial treatment. Soak his foods in selcon and or garlic as well. Higher the protein the better right now. If you can find any of the ocean nutrition veggie flake or pellet, NLS pellet and flake, or New ERA Herbivore rations its going to help. I bought him online and when they shipped him he became really sick we have no really LFS it takes 3 months to get any salt water fish from the pet store here or I need to travel 2 hrs to pick up fish so i found a place that ships in ontario and he was really sick .. The pics are really too blurry to tell what he has but he doesn't look good. He definitely should be in a hospital tank (like a QT tank but only sponge filtration, and ready for meds). You need to also take pics of this fish and send them to the supplier immediately, get compensated and never buy from them again. BTW what part of the country are you in? There are some really good fish stores that will ship as well.